1 . Lehra/Uthan/Mukhra : The tabla solo is played in a rhythmic cycle of sixteen beats, or teentaal. The tabla is accompanied by a cyclic melody played by Ramesh Mishra on the Sarangi. This lehera (or nagma) is not simply the repetition of a fixed melody; it also serves to maintain the soloist's mood and temperament by inspiring the main performer. The subtle ornamentations play a significant role in the success of the tabla recital. Ramesh Mishra is a master in Sarangi playing, performing as a soloist and a popular accompanist for some of India's greatest vocalists. The performance starts with small introductory compositions in the form of uthan and mukhra. Uthan may be fixed or improvised, its role being to portray an impression of acceleration. Uthans generally incorporate a great variety of tabla syllables, including open bayan strokes and both loud and soft dynamics, giving the audience an early indication of the player's skills. 2. Palta Theka: A sequence of variations and improvisations based on and evolving from the prescribed syllables that make up the theka, played in the style of Lucknow gharana.The theka is a prescribed pattern of syllables for any specific rhythmic cycle, or taal. 3. Lucknow Qaida: Kayida is a theme and variation composition type, which often forms the main body of a solo. The main kayida is fixed and acts as a theme for improvisations, which are essentially permutations of the main syllables and phrases of the original composition. The extent of the soloist's imagination and musical skill is demonstrated through the improvised paltas which follow the kayida. 4. Qaida Rela: A composition popular in the Lucknow gharana repertoire which features aspects of both Qaida and Rela. 5. Qaida: Qaida demonstrating great dexterity of left hand bayan strokes. 1-4 Rela: Has the same structure as kayida and follows the same rules, but is composed around bols which have the capacity to be played in fast speeds. This is a sequence of rela compositions based on tabla syllables 'dine gine', 'terekite' and 'dhire dhire'. 5. Gats: Gats are prized compositions within the tabla community. For example, there are many stories of gats being exchanged in dowry gifts at the time of marriages between musical families. 6. Paran: Parans are adapted onto tabla from the Pakhawaj repertoire, pre-dating tabla. They use bold, open sounds of the tabla played in a style known as 'khula baj', literally 'open playing style'. The Pakhawaj is a barrel shaped drum used predominantly in dhrupad accompaniment. 7. Tukra: Tukra is a short fixed composition which combines a wide range of colourful tabla syllables with varieties of dynamics. 8. Rela: Rela based on 'tirekete'. 9. 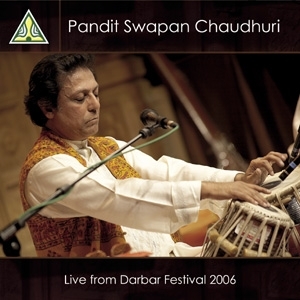 Tukra: Swapan Chaudhuri has played several rare tukra composed inherited from old tabla masters. 10. Chakradaar: Chakradaar is a fixed composition which is essentially a tukra played three times reaching the first beat of the cycle (sam) with the final tehai stroke. © John Ball 2007 - John Ball is a freelance writer, musician and teacher based in Sheffield specialising in Indian Music.